This old favorite free craft eBook gets has received a makeover! Check out the brand new projects and classic crafts with toilet paper rolls. We know what you're thinking - toilet paper rolls, really? Listen up, crafters! Toilet paper roll craft ideas can help you save money and great creative at the same time - you won't believe how easy it is to come up with creative toilet paper roll crafts for the entire family. You can make great pretty jewelry for yourself, decorative bracelets for kids and decor for your home - all with the help of a few cardboard tubes. Not sure how to get started? Take a look at the toilet paper roll craft ideas featured in this eBook, 16 Toilet Paper Roll Craft Ideas, and get inspired. In addition to jewelry crafts like DIY cuffs, you can make plenty of seasonal toilet paper roll crafts. Gather up the kids and help them learn the importance of holidays such as Easter and the Fourth of July. 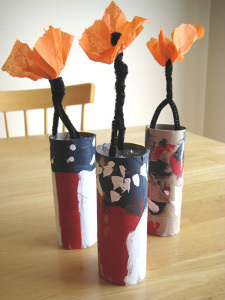 Kids will love making a mess and using craft tools like scissors to customize their own crafts from toilet paper rolls. It's never too early to learn the importance of going green and eco-friendly crafting can be especially fun for young people. Toilet paper roll crafts for kids are a great way to encourage creativity and bring the family together for a singular purpose. Turn off the television and power down the computer - these projects will keep the entire family busy and help foster a sense of closeness. Once the kids have finished their own crafts, you can take the time to create your own toilet paper roll craft projects. Take an afternoon and get creative using inexpensive materials from your own recycle bin - no need to hit up the craft store or even the dollar store. Capture precious moments with a DIY scrapbook design or create wearables like earrings and cuffs. Whether you're crafting alone or spending time with family, toilet paper roll crafts never go out of style or get boring. We here at FaveCrafts think toilet paper rolls get a bad rap. Sure, they’re just small pieces of cardboard that reside in a bathroom and ultimately end up in a recycle bin. However, if you do a little more investigating, you’ll find that this supply can be invaluable for frugal crafters. Believe it or not, there are so many uses for toilet paper rolls, some of which might not seem so obvious. From florals wall hangings to feminine bracelets, cardboard toilet paper rolls serve an important crafty purpose. Adults and kids alike can learn the value of green crafting by recycling toilet paper rolls and using them for craft projects. The next time you sit down to create a new project, dip into your recycle bin and grab a few empty toilet paper rolls. Let your imagination be your guide as you create brand new items from a commonly discarded material. It’s time to save big and get creative with toilet paper rolls … what will you make first? Our eBooks, like all of our craft projects, are absolutely FREE. Please feel free to share with family and friends and ask them to sign up at our website for free newsletters from FaveCrafts.com. Ready to get started? It's time to start coming up with some creative toilet paper roll craft ideas that you can make, use and give as gifts. There are so many crafty options and you can display your DIY creations in almost every room of your home. Best of all toilet paper roll craft projects come in a variety of shapes and sizes, so you'll never get bored or feel like you're making the same project over and over again. Whether you love the look of trendy designs or want to make something a little more traditional, you're sure to find a toilet paper roll craft to fit your needs and creative pursuits. Everyone can use a little help getting organized, so start your creative journey by crafting an Owl Desk Organizer (p. 11). This simple craft with toilet paper rolls is so fun to make - the colors are sure to catch your eye. You'll never forget where your craft supplies are stored when you have this homemade organizer on your desk. You can also create a variety of crafts for a party - toilet paper roll crafts are a great way to save on supplies before the big day! You can decorate tables with homemade Eco Green Tea Light Holders (p. 9) and Pretty in Pink Party Poppers (p. 12). Be sure to fill the poppers with candy or confetti - it's a great way to leave guests with a surprise when the celebration concludes. Parties can get so expensive, so it's always nice to cut corners and use eco-friendly, inexpensive items like toilet paper rolls. Luckily, our eBook featured a ton of fantastic, unexpected crafts for any occasion - the creative options are endless. Download your free copy of 16 Toilet Paper Roll Craft Ideas today! Sure, it's fun to make crafts with toilet paper rolls on any old day, but when a specific holiday rolls around, nothing is more satisfying or fun than crafting for the day. Take advantage of the holiday spirit and excitement and make a few toilet paper roll crafts that you can display after the day is finished. You can make these crafts for a party or use them to add a dash of fun and excitement to your space - there are so many possibilities when you use your imagination. Best of all, you can make these projects for a variety of holidays throughout the year. Every season calls for a few toilet paper roll crafts and this eBook is sure to get you in a crafty mood. Halloween is one of the most fun and exciting holidays of the year - kids love it for obvious reasons (one word, five letters - candy! ), but parents can also get in on the fun by creating some DIY projects. A toilet paper roll craft you can make for Halloween is a Trio of TP Tube Treat Bags (p. 22), each of which is completely unique and festive. There are three different options, so no two bags have to be the same. When the spring comes, parents can make an Easter craft with toilet paper rolls and use it for decoration. Easter Bunny Napkin Rings (p. 25) can be made by kids and used for brunch - what a great way to save on place settings and add a personal touch to an already sentimental day! When you think of jewelry, you might imagine diamonds, rubies and sapphires. You might even imagine gold and silver. But toilet paper rolls? Seems like a bit of a stretch right? Well, this again, because there are so many toilet paper roll craft projects for DIY jewelry. Open up your mind and use your creativity to create wearable crafts and designs you'll want to show off. You can even make some of these crafts and give them as gifts - people might not know that you dipped into your recycle bin for these projects, but they'll certainly love the final products. You can even make crafts with toilet paper rolls for kids to wear and show off to friends. What little girl wouldn't want to wear a pretty pink handmade bracelet that was designed specifically for them? Talk about a princess moment! This eBook featured three beautiful bracelet designs that people will want to wear and show off. Use a paper doily and a toilet paper roll to create a Doily Cuff Bracelet (p. 37) - it doesn't get more simple or inexpensive than this genius jewelry craft project. You don't have to be an expert jewelry designer to bring this cuff to life, either. If you have the necessary supplies and an urge to craft, you'll be able to quickly make your own version of this project. 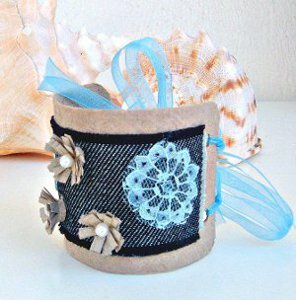 Another DIY bracelet tutorial in this eBook, Toilet Paper Roll Bracelet (p. 43), is sophisticated and pretty but so easy to make. 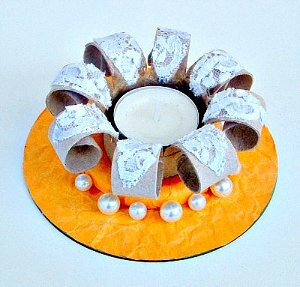 Use ribbon, fabric, pearls and more to embellish a plain cardboard tube - toilet paper roll crafts don't get much better than this. You can wear this cuff with a fancy outfit or throw it on when you head to the grocery store - it's just so versatile! The third bracelet craft is just for kids (or child-like adults) - Pretty Recycled Princess Bracelets (p. 46) are perfect for little ones with big imaginations. Craft jewels and paint turn boring brown pieces of cardboard into toilet paper roll crafts for kids. If you don't love the look of DIY bracelets, you can create your own Reversible Cardboard Roll Earrings (p. 46) and wear them all year long. Change the way you look at toilet paper roll craft ideas and eco-friendly DIY designs. From pretty jewelry projects to delightful home decor ideas, the projects in 16 Toilet Paper Roll Craft Ideas are great for crafters of all ages and expertise, and you can even find inspiration for seasonal crafting all year long! Download your free copy of 16 Toilet Paper Roll Craft Ideas today! Reply to HegWitch, if you think the craft is gross then use paper towels and/or wrapping paper rolls, there is absolutely no need to be so hateful. If you don't want to use the alternatives, then just don't. I really do not understand why people can say this things about the toilet paper rolls crafts I thinkl they are a very nice way to recycle things and no need to be so frick!! about bacteria, cause after all you use paint and you wash your hand after doing this craf!! what it's wrong with you people?????? the worl is turning crazy defenitly!!!!!!!!!!!!!! Yes it definitely is, and they definitely are! Toilet paper rolls are great for recycling. My church collects them sometimes to stuff with candy and wrap with paper and twist the ends with a ribbon and toss them into the audience at kids' sporting events and stuff. There are lots of ways to reuse them. My bathroom may not be the cleanest because I have cats, but that doesn't have anything to do with the toilet paper rolls! hahaha! Why do people insist on telling others to use Toilet Paper Rolls? There is soo much Bacteria and Ecoli in those nasty gross things. I think the book would be great as long as you use Rolls from Gift Wrapping, Paper Towels, Foil or Plastc Wrap. Toilet paper rolls are not dirty, nor do they contain e-coli, the dirty parts on flushed down the toilet. Don't be ignorant. I would love to have the free craft book also. as I love to do crafts!!!!!!!!! no no no do not reuse toilet tissue rolls! NASTY! I use paper towel rolls for all my cardboard crafts. This sounds like a craft for folks who don't bother to wash their hands after visiting the bathroom - airborne germs (e-coli?) travel a fair distance when a toilet is flushed. Please don't allow children to play with 'spent' toilet paper rolls - nor use them as containers for any candies or other hand-mouth related items. Basic personal hygiene flags this up as a 'no-no' craft - unless there is a source of new (germ free) cardboard rolls. I would love to have a free craft book . I do crafts all the time but I dont have that book. Bonjour vous tous, J'aimerais savoir si nous pouvons avoir des model en franais. J'attend de vos nouvel avec impatience. Merci!